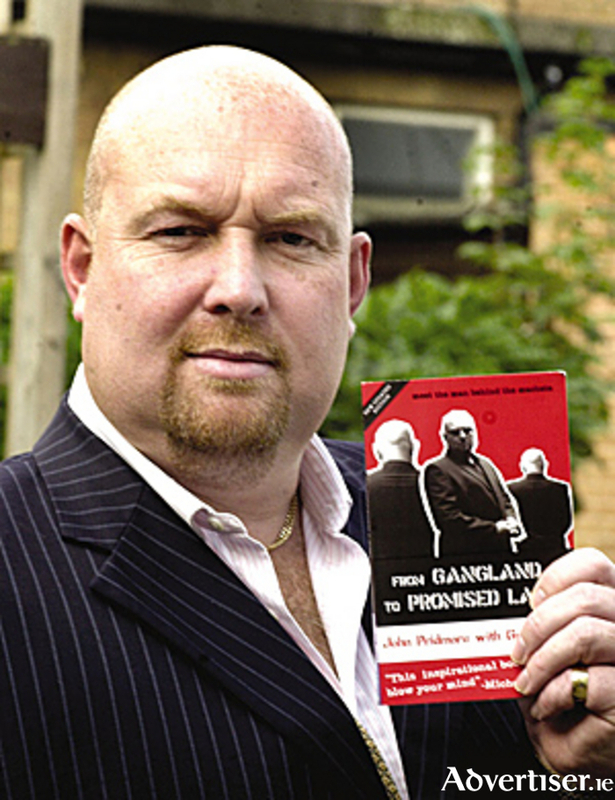 John Pridmore, the ex gangster who found God. A former London gangster, who served two prison sentences and only turned his life around after nearly killing a man outside a nightclub in the English capital, will speak at an advent mission in St John the Apostle Church in Knocknacarra next month. John Pridmore will return to the parish two years after his last visit as part of the mission being given by the evangalist and founder of the lay consecrated St Patrick’s Community which has given more than 200 missions in Ireland and the UK in the past 15 years. The Galway event will take place from Monday December 5 to Friday December 9 at 7.30pm. (Wednesday’s session is at 6.30pm ). Bestselling author Mr Pridmore recently travelled to Los Angeles to meet Hollywood producer Paul Kelmenson who is interested in bringing Pridmore’s story of hope and finding God to the big screen. The acclaimed producer was responsible for the blockbusters Ronin and American History X .
John Pridmore (52 ) who stands at 6’ 5”, looks like a hard man. Born in London’s East End, the son of a policeman he had a normal childhood until his secure world came crashing down when his parents divorced. He was 10-years-old. He spent time in a detention centre and later prison. After he was released, he began working as a doorman in London’s East and West End clubs. It was there that that the now reformed gangster, whose jackets were especially tailored to hold his machete and knuckle duster, became involved in organised crime. His drug deals netted him a fortune. He had a penthouse, sports cars, designer suits and a string of beautiful women. After an afternoon out walking with a friend who “made an honest living” a clearly troubled John asked him for advice on dealing with the ghosts of his past. “Leave the past with God” he advised. The words struck a chord with John. Later he said he became aware of a “voice speaking in his heart”. John, who now lives in Carrick-on-Shannon, Co Leitrim, began to distance himself from his old life and follow the path laid out by his faith. Since then he has travelled internationally and spoken to more than 2.5 million people warning the young about the dangers of the gun and drug culture. He worked with St Mother Teresa whom he described as “fearless” and “full of God”, he was a friend of Pope John Paul 11, he visits prisons all over the world and is an international preacher with a string of bestselling books to his name. He visited 16 countries last year. He says he shares his story so that “others might be saved”. St Patrick’s Community, led by John Pridmore, who have given more than 200 missions in Ireland and across the UK during the past 15 years, including one at St Joseph’s Church in Galway recently, is delighted to return to Galway with a new mission programme. The themes include: God the Father’s plan for us (Monday ), Renewed Freedom in Jesus (Tuesday ), Healing of our Wounded Heart - Mass and healing service (Wednesday ), Saints of God (Thursday ), Mass of the Holy Angels (Friday ). On the back of his bestselling biography From Gangland to Promised Land, John Pridmore has released his latest book entitled Journey to Freedom, which examines inner awareness and healing and speaks of his work helping young teenagers and ex gang members. Page generated in 0.2028 seconds.